For anyone nostalgic for the world of John Le Carré, the last week would have been a boon. A former double agent and his daughter found unconscious on a park bench, allegations that Mother Russia poisoned her wayward son using a secret nerve agent ('Novichok') and diplomatic repercussions — all very much the sort of thing with which George Smiley, Le Carré's fictional MI6 spook would have been very much at home. However, before assuming that life imitates art, it would be well to check our facts — not least because stumbling into war with a nuclear power seems a silly thing to do. While the Skripals are still in hospital and, as far as we know, haven't said much about the incident, a great deal has been alleged. Even to a non-chemist such as myself, much of this does not add up when stacked against information in the public domain. First, while Skripal undoubtedly was a double agent (apparently turning on his Russian employers for financial gain, rather than out of conviction), he served four years of a 13 year sentence before being pardoned and swapped for Russian spies (Anna Chapman and her colleagues) back in 2010. His daughter, Yulia, visited Russia frequently. No-one has explained why Russia would wish harm to a superannuated double agent some 20 years after his glory days and eight years after freeing him from custody. If they really had wanted the man dead, a convenient accident could surely have been arranged while he was still in prison. Given that relations between Russia and the West are already at rock bottom and given Russia's current situation (elections and the hosting of the World Cup soccer tournament coming up in a matter of months) the timing seems even more surprising. Second, it is far from clear that the nerve agent at the centre of the drama was ever successfully made by the Russians, let alone that they are the only possible culprits. Novichok ('newbie' in Russian) was alleged to be the name given to a group of nerve agents developed by the Soviets in the late 1970s, so secret that it was not declared when Russia signed onto the Chemical Weapons Convention in 1992. "While it would be reassuring to be able to take government declarations on intelligence agencies' conclusions at face value, we have a lot of experience of late of politicised or even wholly invented intelligence." Until 2016, the only proof we had of its existence was the allegation of a lone Soviet military chemist, Vil Mirzayanov, who helpfully gave the formulae for the family of chemicals and for each of its individual members in a book he wrote ten years ago about his experiences. 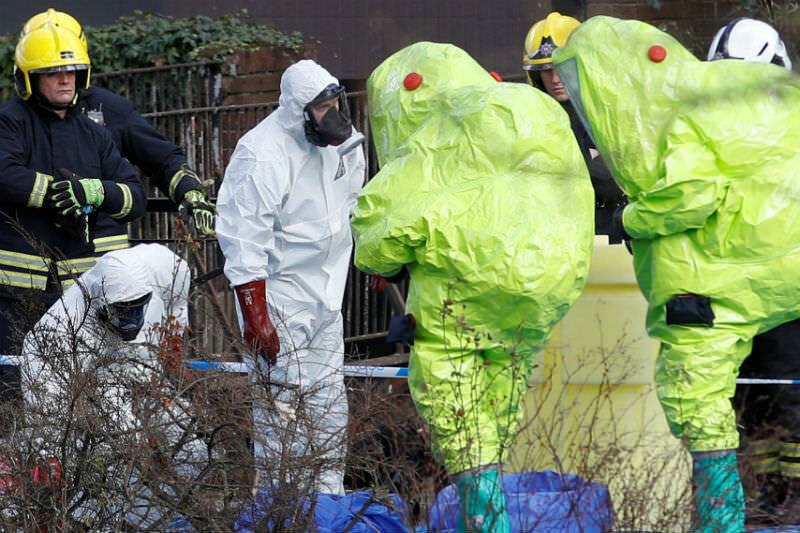 No-one had been able to confirm the alleged formulae and the Organisation for the Prevention of Chemical Weapons (OPCW) had accordingly declined to add 'Novichok' agents to its list of banned chemicals. In 2016, however, Iran successfully synthesised 'Novichoks' in cooperation with OPCW and details were added to the OPCW database. Certainly the US would arguably be in a better position to make them these days than the Russians. The Nukus plant (in Uzbekistan) which Mirzayanov claimed to have manufactured Novichok was dismantled with US help in the early 1990s and the alleged inventor himself has been living in the United States since being acquitted in Russia of revealing state secrets. Equally, if the 'newbies' were used in Salisbury, one would have expected rather more lethal results. Mirzayanov claimed that some, at least, were five to eight times more deadly than VX. This is a persistent nerve agent developed in the 1950s, 30mg of the vapour from which can kill in under a minute. In Salisbury, by contrast, we have two people in hospital and a public health warning (issued a week after the attack) suggesting that people exposed might wish to wipe down any hard objects with a tissue and put their clothes in the wash. Finally, even assuming that all the above reasons for scepticism are ill-founded, there are established mechanisms for refereeing alleged uses of chemical weapons under the Chemical Weapons Convention (to which both Britain and Russia are signatories). The fact that the UK has refused to make use of these, or to hand over any samples of the alleged agent used on the Skripals, is also rather surprising in light of the extreme actions it has taken in alleged retaliation. While it would be reassuring to be able to take government declarations on intelligence agencies' conclusions at face value, we have a lot of experience of late of politicised or even wholly invented intelligence. One has only to remember the tearful (and bogus) stories of babies thrown out of incubators before the first Iraq War or Colin Powell and his vial of alleged Iraqi 'weapons of mass destruction' before the second. This need for caution would seem only to be enhanced where the protagonists of any new conflagration could wipe the whole of humanity out within half an hour. I am grateful to Justin Glyn SJ for independently researching and writing this, and to Eureka Street for publishing it, in the face of obvious reluctance by mainstream media and even prestigious Australian online websites to host any challenge to the approved narrative of atissian presumed ‘most probable’ guilt launched by Theresa May. We have of course been here before - Gulf of Tonkin , Saddam’s CBW, Assad’s alleged sarin gas attacks on Syrian people, all proved eventually to be lies. I suspect Novichok will prove to be another false-flag alleged Russian crime. We need to keep an open mind. Just because the story comes out of a London does not mean it is true. No one can deny that Britain and Russia are two power-brokers of the international stage. And there is a long history between these two nations of being at loggerheads. Sometimes throwing out each others' diplomats can clear the air and cultural anxieties and ideological concerns can undergo a spring clean. The fact that the components are known and easily obtainable does not logically imply that their compounding into the final toxic product is trivial. Everyone now knows how to assemble a nuclear weapon; uranium turns out not to be so rare in the Earth's crust and the other essential materials can largely be procured retail. Does that mean that any bozo can set up a weapons plant in their back yard, as if to manufacture ice? Let's ask North Korea, Israel, Pakistan etc. etc.. The article does not convince. By their deeds you know them. Polonium is certainly not easily manufacture outside a sophisticated facility, and Litvinenko is assuredly dead. Western nuclear powers don't use polonium in their nefarious weapons any more. May is absolutely right. Or Putin ordered this hit, or he has lost control over his weapons of mass destruction. We are not talking here of NATO propaganda as a pretext to oust a ME tyrant. We are talking folk who have nothing to do with Skripal's past, or his ex-pals', but of people who came to assist, as is their civil job, and whose lives are also now in jeopardy. Wow! Thank you Justin. This is the best thing you have written. Deserves to be widely read. Thanks, Justin. A challenging perspective, in light of the consensus in the popular media. Hope you're able to send a copy to the UK Government for their response. L'Angleterre, ah, la perfide Angleterre. (England, ah, perfidious England) These words of the great French cleric Jacques-Benigne Bossuet (1627-1704) I as a pre-World War 2 baby imbibed almost with my mother's milk. Certainly from my early British History lessons as taught in the Irish Christian Brothers Grammar School I attended in Belfast in the 1940s. So from an early age I was conditioned to be sceptical about the British and their view of the world. I was taught about The Great Game, an expression coined by Captain Arthur Connolly (executed as a British spy 1842) to describe the British-Russian struggle for control of central Asia. Sir Robert Menzies besotted admiration for the Monarchy and the British Empire left me no choice but to support the Australian Labour Party when I came to Australia. Despite the aberrations of the ALP over the subsequent years, from the 1950s to the present day, I was never tempted to transfer my allegiance to any pro-British or Monarchist party. This adamantine antipathy of mine compels me to see the holes in PM May's position on the alleged attempted poisoning of the Skripals. Fr Glyn has just exposed some of them. More strength to his arm. '...the only proof we had of its existence...'. Who is 'we'? Certainly, most informed histories of Soviet intelligence 'special operations' record a multiplicity of assassinations and strongly suspected murders from the 1930's commonplace in the post WWII Eastern Bloc right through to KGB's Chairman Andropov's infamous 'active measures' Order on 12 April 1982. Extrajudicial execution by overt and covert means is a recognized feature of Russian response to perceived treachery. We may always challenge a circumstantial case. Did we need scientific evidence before we accepted better evidence in the Lindy Chamberlain tragedy? Based on original Australian belief dingo's may steal a human infant. Based on experience the Russian State has long-practised extra-territorial extra-judicial execution. Who would deny that?-the means may be uncertain but the proclivity is in my opinion firmly established. Given Putin`s Russia`s gory and prolific track-record of retributional murder, this is a remarkable defence of what is by far the most likely, and indeed indefensible, scenario. I am just amazed to read this. It also looks according to a number of reports that the Skripals are going to die, presumably of hypoxic brain damage and multi-organ failure, so this is hardly a trivial event. And there is motive; killing a traitor must surely have gone down well in Putin-country just before what passes for an election there, don`t you think? A very interesting view on the case, Justin. There is a certain President in a country far away (and whose mind sometimes seems to inhabit a galaxy far, far away) who might not be disadvantaged by Skripal’s demise. I have read that Skripal has an associate who is connected to ex MI6 agent Steele, who in turn prepared a dossier on aspects of that President’s connections with Russia. "No-one has explained why Russia would wish harm to a superannuated double agent some 20 years after his glory days and eight years after freeing him from custody. If they really had wanted the man dead, a convenient accident could surely have been arranged while he was still in prison." I can't get passed that statement makes sense to me! The butler probably did it. Proof? Argument? What argument? I suspect that many of the people making comments haven't actually read Fr Glynn's article and realised he's not actually saying that Russia wasn't responsible! He's merelyt saying that there's no conclusive evidence! The flip flopping May narrative has more holes in it than a cheesy yellow-cake. now it turns out it was on his front door (not the BMW). So 2 people come into contact with a nerve agent more powerful than VX. Go for a drive, a meal, and then the pub... before succumbing to the effects.... but one of the 1st responders is affected immediately. If the chest beating is any indication I'd consider ducking for the next 25 years. preferably before some ambassador's daughter waxes lyrical about babies being chucked out of incubators. Sorry neo-liberal West, the facade is gone, we see you're true face with every passing day. incidentally; about 50 Yemeni kids died of malnutrition in the time it's taken to write this. Don't worry though; poodles will do his part to help their tormentors spread democracy with the help of BAE and Austal before Plod turns around the few that make it here. St Ignatius would must be turning over in his grave. Freedom is a common word that is often used in our daily lives, but it is not easy to define. Freedom for me means being able to express myself and be outspoken. It means thinking for myself and being free to be curious. Finally it means preserving important economic, social, and cultural rights. I am a North Korean refugee who escaped in 2012 for this freedom.